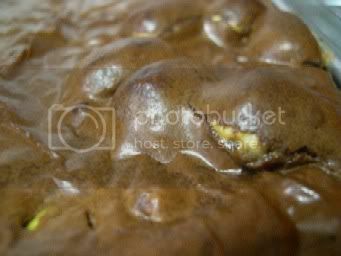 I've tried a few brownies recipe and find this one the best. Not dry, not cake-y or biscuity. Just moist and chewy. Thanks for the recipe. 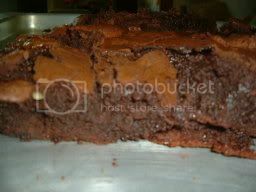 I baked the brownies today and it was absolutely yummy- moist and chewy according to the title. However, a couple of questions. I added the marshmallows and after baking, i noticed there was no trace of the marshmallows. It sort of melted inside. Is this right? Also, the baking paper was stucked to the sides of the brownie thus i had some problem peeling it off. The top of the brownie was also slightly burnt. Maybe i should lower the temperature a bit or shorten the baking time. Did you brush the pan with butter/oil before you line the baking paper? 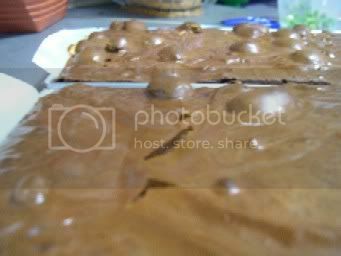 You can lower the temperature by a bit, you can use the lower rack, you can reduce baking time and you can throw in a piece of aluminium foil over the brownie at the last few minutes. Hi Sophie, can i keep this overnight? How many days i can keep this brownies? Most of the time, i like to prepare and bring to my colleagues n family members the next day. They can only eat it like 1 or 2 days later. So wondering can keep for them.. Thanks for the tips. I greased the pan as well as the paper. Anyway, I shall definitely keep this recipe and use it going forward. Both my kids had it with ice cream topping and they simply love it. hi, i'm sorry to ask this again, but when you say 1 1/2 cup plain flour (sifted) it means after or before sifting? i hope to try this recipe asap! 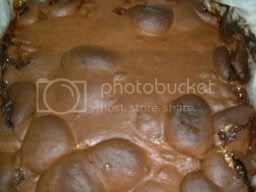 i loooove brownies..............mmmmmmmm! Measure 1 1/2 cup plain flour and then sift OR after measuring flour and cocoa powder, sift them together. First 3 days is the best. I still have some leftover now. I baked twice on children's request. I think they've had enough. Today is the 7th day...outside is dry but inside is still moist. Ice cream!!! Tried that..yummy!! OK.. going to buy ice cream later so that children can finish the leftover. Just checking. You mentioned your brownie is 7 days old. You kept it in the fridge? How long can you keep outside? I noticed too that the outside was abit dry at the end of the 2nd day. Anyway, now its all gone. I normally keep my cake in the fridge after the 2nd day. Afraid it will turn mouldy in our weather. As for the brownie, I will microwave it for awhile before serving with the ice-cream. It was kept air tight on the kichen table all the while. Outside dry, inside very moist and still no mould. Sorry for my stupid question. When add egg into the hot mixture, will the egg get cooked, and difficult to mix? Likewise fr the flour? No it won't as the heat from the simmering water is not very hot. If in doubt, rest the melted ingredients for 5-10 minutes before adding the eggs. Thanks Sophie, I shall give it a try soon. wow!! I'm going to give it a try soon!! Thanks!! Finally, I tried this recipe on saturday. Though the outlook of my brownie is really ugly, the taste was really great. Moist n chewy but a little sweet. My family, friends & colleagues love it. Wow! I will try this during the weekend! Glad you like it Dream. My brownies were a lilttle hard n dry. Mebbe bake them longer than i should. But nevertheless, they were still delicious! The kids ate them all up by the end of the day! Wow, your brownies look nice and neat. Here is my picture, see....really ugly looking. You should cut down on baking time and stirring. It may feel not baked yet after 30 minutes but it's alright after it cools down. Ooops..Alamak! :shock: I wet my keyboard . Must go make brownies now. :lol: Chow!!! Ugly hor, shall try again with a smaller bake tin. You called yours ugly? Look at mine...uglier? Who cares when it taste wonderlicious! These are marshmellow bumps too..made yesterday after drooling over yours and sspak's.